Monmouth Pain & Rehabilitation is proud to host 8th Grade interns from the Red Bank Charter School. 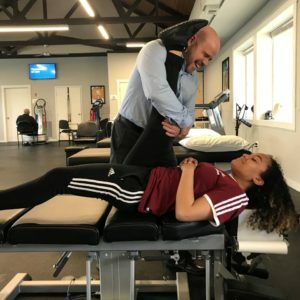 One of our interns, Viridiana Cielo, interviewed one of our Shrewsbury physical therapists Riddhi Patel to find out more about Riddhi and what it’s like being a physical therapist! How long have you been a Physical Therapist? I’ve been a Physical Therapist for 8 years. I attended to the University of the Sciences in Philadelphia. How many years of school did you complete to become a PT? I took 6 years of college. Did you always want to be a Physical Therapist? I definitely always wanted to be in the health field. What inspired you to be a Physical Therapist? I like the idea of helping people move around, be active, and do sports. What kind of things do you need to know in order to be a Physical Therapist? I have to know anatomy, communication, and neurology. What is one of the biggest challenge you had to face while learning Physical Therapy? One of the biggest challenges I faced was putting together all the information I was learning and make sense out of it. What type of things do you do on a daily basis? I help people ease their pain and injuries. We deal with a lot of knee, back, and shoulder pain. What are some things you have to be really careful about with Physical Therapy? I have to be careful that I’m not causing pain or soreness for the patient. What are some challenges you face being a Physical Therapist? Some challenges I face are insurance limitations and patients’ time constraints when treating. Monmouth Pain & Rehabilitation is proud to host 8th Grade interns from the Red Bank Charter School. One of our interns, Mei-Ling Downey, interviewed our Shrewsbury/Freehold acupuncturist Hugh Kim to find out more about why Hugh became an acupuncturist, his inspiration, and more! I was born and raised in Korea. What college did you attend, and for how many years? I went to Binghamton University for 4 years of undergrad. What degrees did you need to become an acupuncturist? You can attend programs after college, but I have a Masters in Oriental Science; you can get that or a masters in acupuncture. How long did it take you to learn about acupuncture? I completed 4 years of Masters, but I am always learning as there are so much to learn about. What kind of things did you need to learn about to become an acupuncturist? I had to study western forms of medicine and oriental medicine, and the many different pressure points on the body. There is a lot to learn, like the history of oriental science, which goes very far back into history. What was the hardest thing to learn about acupuncture? It was hard to master timing, when to put the needle in and the pulses . Also the history of oriental science is always been hard as there is so much to learn. Did you always want to be an acupuncturist? I never was definite on being an acupuncturist, but my grandfather was an acupuncturist, and that encouraged me to become one. In college I found out you can go to acupuncture school so I decided to attend. I wanted to be a scientist, or in the scientific field. If you weren’t an acupuncturist what would you be? I think I’d be a dentist. Are there different needle sizes in acupuncture? There are few, like long ones to hit the pressure points that are farther down into the body and prickers for the points that are closer. Do you ever do acupuncture yourself? Yes I sometimes do acupuncture for myself if I need it. Were you ever afraid of needles? I wasn’t very comfortable with them before I became an acupuncturist but over time I just got used to them. If you would be interested in trying acupuncture for yourself, you can schedule an appointment with Hugh or any of the acupuncturists in our other locations by calling 732-345-1377. A new study has shown that using physical therapy as the first point of care for patients with low back pain reduces overall health care costs and opioid usage. According to the National Institutes of Health, 80% of adults experience low back pain at some point in their lifetime being the most common cause of job-related disability and a leading contributor to missed work days1. In addition to being a common ailment, low back pain is among the most common disorders associated with prescribed opioid use in primary care2. According to the new study, when patients turn to physical therapy as the first point of care, they enjoy the benefits of lower health care spending and opioid usage in relation to treating their back pain. The study, published by Health Services Research, compared the differences in opioid prescription, health care utilization, and costs among patients with low back pain who saw a physical therapist at the first point of care, at any time during the episode, or not at all. The patients were between the ages of 18-64 years old with a new primary diagnosis of low back pain and were observed over a one year period. The main findings of the report detailed that patients who saw a physical therapist at the first point of care had an 89.4% lower probability of having an opioid prescription, 27.9% lower probability of having any advanced imaging services, and 14.7% lower probability of ER visits, as well as significantly lower out-of-pocket costs compared to patients who saw a physical therapist late or not at all3. The findings of this study emphasize the world of benefits physical therapy offers patients – most importantly – lasting relief from addressing musculoskeletal issues appropriately. Additionally, patients avoid opioid usage by getting to the root of the problem to provide real relief. Lastly, patients may face lower out-of-pocket costs and avoid undergoing costly diagnostic imaging procedures. If you are suffering from a new diagnosis of low back pain or have been battling chronic low back pain, now is the time to realize the benefits of a comprehensive physical therapy program. Let Monmouth Pain and Rehabilitation be your first point of care for treating your low back pain. Together, we will help lower your overall health care costs by avoiding opioid prescriptions, advanced imaging services, and ER visits that may arise due to the development low back pain complications. Filed under Acupuncture, Chiropractic, Physical Therapy. High school sports play an important role in developing a healthy, active lifestyle for kids while also developing invaluable life skills such as goal setting, time management, leadership, cooperation, and social intelligence. At the same time, youth athletes are prone to injuries just like their favorite pros. Youth athletes also face an increased risk of injury due to the fact that their bodies are still developing. It is key to find the optimal recovery options so that your kids can be back in action without missing too many games or practices – Monmouth Pain & Rehabilitation can make that possible! Though a large portion of sports-related injuries did not require surgery, recurring injuries accounted for almost 10% of total injuries for the year. It is vital to understand that treating the symptoms of an injury does not always address the underlying cause of the problem. Pain medication can reduce inflammation and mask the pain giving the illusion that the injury has healed. Just because the pain subsided does not mean the injury has fully healed resulting in the increased risk of reinjuring the affected area. Through effective injury management and preventative care, we can help keep kids active, healthy, and on the field! That is why it is important to understand the benefits that physical therapy, chiropractic, and acupuncture bring to the injury recovery and prevention process. Physical therapy works to maximize movement during the recovery process, and seeks to avoid pain medication and surgery. This is achieved by assessing the extent of the injury, and creating a treatment program specific to the patient’s needs and capabilities. Physical therapy can be utilized not only after an injury has occurred, but at the first signs of tenderness and weakness. For instance, many times an athlete will perform through pain, further increasing their chance of injury. Consulting with a physical therapist at the first sign of pain will help to strengthen the affected area before the pain manifests into a debilitating injury. Chiropractic care plays a key role in sports injury prevention and recovery. Training, practice, and competition take a toll on an athlete’s body, exposing them to increased stress that can result in chronic aches and pains which may lead to injury. Chiropractors correct spinal misalignments, fix asymmetries throughout the body, and increase range of motion by reducing the tension on muscles and tendons, which promotes faster healing and reduces the risk of injury. Chiropractic care is effective in injury prevention and can also benefit an athlete’s performance. Seeing a chiropractor without a preexisting injury is a proactive step in injury prevention. Acupuncture produces improved energy and biochemical balance, which results in stimulating the body’s natural healing abilities and promoting physical and emotional well-being. Acupuncture is a common practice used by many professional athletes around the world. Studies show that acupuncture effectively treats sports injuries, while also improving the athlete’s performance and endurance. The growing popularity of acupuncture treatment raises awareness of how beneficial acupuncture is for injury prevention. Monmouth Pain and Rehabilitation is Your Home Team! 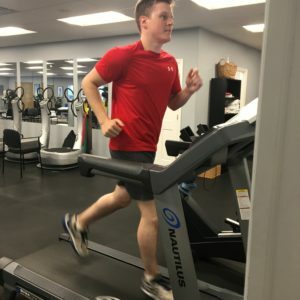 If you or your child have experienced a sports injury in the past, are currently facing a sports related injury, or want to take the proactive steps in strengthening and optimizing your body for peak performance, please feel free to take advantage of our free consultation (a $245 value) and contact us directly by calling 732-345-1377 or by emailing us using the Contact Form below. Monmouth Pain and Rehabilitation has three convenient locations in Monmouth and Ocean County: Shrewsbury, Wall, and Forked River. We look forward to helping with all your rehabilitation, physical therapy, and chiropractic needs! Filed under Physical Therapy, Wellness. Most people have probably been on a treadmill at some point in their lives. It’s an incredibly useful exercise machine that is great for people of all fitness levels, whether you’re looking to have a reasonably paced walk, a steep uphill climb, or a more vigorous run or jog. While using a treadmill can yield a number of health benefits, it is crucial to be sure you’re utilizing the machine safely and correctly. Make sure you don’t make these six mistakes when on the treadmill, to avoid injuries and ensure a beneficial workout. Warming up gets your muscles ready to exercise, boosts blood flow, and increases oxygen supply, which improves performance. Taking your time before launching into a full-blown run can also help prevent injuries. Start at a comfortable speed to warm-up and gradually increase speed. If you are going to run, be sure to walk for a few minutes before and after running to give your muscles time to warm-up/cool-down. It may seem like a safe idea to hold onto the bar at the front of the treadmill when walking or running to avoid falling off the back of the machine. We will admit that it is helpful to hold on as you start the machine until you are comfortable enough to let go. Then, be sure to let your arms swing. Arm swing is a natural part of our gait and holding on while walking/running can inhibit this natural pattern. If you’re not quite comfortable on the treadmill, you may get the urge to look down at your feet, but try to avoid doing that. Posture is incredibly important when exercising, and looking down may actually cause you to lose balance. Try to remain as upright as you can, look forward, and don’t hunch over. Some people place themselves as close to the front of the treadmill as they can to prevent themselves from falling off the back. However, it’s important to center yourself and utilize the entire belt. This allows for a full stride and free upper body movement. Be sure to drink plenty of water before, during, and after your workout, especially if you’ll be running. Drink 16 oz 2 hours before your run, 5 oz every 15-20 minutes during, and another 16 oz after. Muscle repetition and overuse are major causes of injuries and machines like the treadmill are a huge factor in this. Running in one straight line, at the same incline and same pace through every run will likely lead to overuse and therefore injuries. The wisest choice would be to run outside to mix it up with turns and natural inclines. If you’ll be sticking with the treadmill, just change up your speed and use that incline function. It will give you a more complete and effective workout, and confuse your muscles in a good way. If you’re interested in learning more about proper workouts, or you have experienced an injury from running, sports, or your daily activities, please give us a call at 732-345-1377. The team at Monmouth Pain & Rehabilitation is skilled in treating a wide range of injuries, as well as educating in injury prevention. Written by: Dr. Nicole Yarbenet, D.C.
Often times, people perceive chiropractic care as a series of “back cracks”. But it’s so much more than that. Chiropractic allows for optimal health throughout the body, for all ages. Our Wall NJ chiropractors and Shrewsbury NJ chiropractors can treat a wide variety of health issues. Pediatric chiropractic is also something worth exploring for your children. During pregnancy, there are several physiological and hormonal changes that occur in preparation for creating the environment for the developing baby. Chiropractic for pregnancy pain can help in maintaining a healthier pregnancy, reducing the time of labor and delivery, relieving back, neck or joint pain, and preventing a potential cesarean delivery. People suffering from anxiety have an overly active sympathetic nervous system which controls our fight or flight mechanism. The thoracic vertebrae are highly innervated by the sympathetic nervous system, therefore, any irritation of that area will cause symptoms of anxiety. Adjusting the thoracic spine will calm down this response and relieve anxiety. Headaches are a common problem. A majority of headaches originate in the neck. When you have a headache it is important to see your chiropractor. Your chiropractor can perform a spinal adjustment to improve spinal function and alleviate the stress on your system. They can also provide nutritional advice, recommending a change in diet and perhaps the addition of B complex vitamins. Your chiropractor can also offer advice on posture, ergonomics (work postures), exercises and relaxation techniques. This advice should help to relieve the recurring joint irritation and tension in the muscles of the neck and upper back. Chiropractic cannot necessarily treat ADHD but it can help decrease the symptomatology. ADHD is a central nervous system disorder that causes tension on the nervous system. A chiropractic adjustment can help calm down the nervous system by releasing nerve tension. Comfortless crying and periodic fussiness can be very upsetting to a new parent and even more upsetting for baby. This condition can last for hours or days. Colic is characterized by a loud piercing cry, tensed abdominal muscles, flexed legs, and clenched fingers. Any type of vertebral subluxation can adversely affect the child’s nervous system resulting in colic symptoms. A chiropractic adjustment helps to restore normal function in a child’s nervous system, bringing it back to full normal potential. The result is a happy and content baby. The nervous system controls the digestive system in many ways. The vagus nerve which comes from the brain and travels around the first cervical bone innervates all the major organs of digestion and functions to stimulate the digestive process. Other major areas controlling digestion include the sympathetic nerves coming out of the thoracic and lumbar regions of the spine. Spinal misalignment in any of these regions can lead to neurological compromise and altered digestive function. Regular chiropractic adjustments can help alleviate digestive problems. Your sinuses consist of hollow spaces in the bones of the forehead, cheeks and temples. Healthy, open sinuses are lined with sticky mucus to ensure that air going into the lungs is moist, warm and free from dust, dirt, and pollutants. Your Chiropractor is specially trained to help properly drain the sinuses with specific cranial and upper cervical adjustments. Chiropractic care is also proven to help boost the immune system. There is a direct relationship between the immune system and the central nervous system. If we support the nervous system through proper spinal function and alignment, then we will ultimately support and strengthen the immune system. Bed-wetting (enuresis) is another of the many reasons why parents bring their children to see the chiropractor. Emptying of the urinary bladder is controlled by the detrusor and trigone muscles. The nerve supply to these muscles is via the sacral parasympathetic nerves from S2 to S4. Adjustment of the sacral segments in children will relieve any nerve interference that contributes to bed-wetting. It is very frustrating when a newborn has a difficult time latching on to breastfeed. This can be upsetting for mom and baby. The birth process is very traumatic to an infant’s upper cervical spine. Correcting the misalignment with a gentle adjustment will help the baby latch on without difficulty. Chiropractic care can help manage your stress levels. When you experience stress, your body releases stress hormones into your bloodstream, including cortisol and adrenaline. These stress hormones cause a whole series of physiological changes in your body, such as increasing your heart rate and blood pressure, shutting down your digestive system, and altering your immune system. One of the effects of chronic stress is muscle tension and contraction, which can lead to uneven pressure on the spine, which in turn leads to subluxations. Adjustments help ease muscle tension, which will diminish the stress on certain parts of the skeleton leading to stress reduction. If you or anyone you know is suffering from any of these conditions, please contact Monmouth Pain & Rehabilitation for a FREE consultation ($245 value). To schedule a consultation fill out the form below or give us a call at 732-345-1377. Our Shrewsbury & Wall NJ chiropractors provide expert service, and can combine adjustments with a number of our other modalities, for an all-encompassing, effective treatment. MPR Chiropractor Dr. Nicole Yarbenet explains in the above video that ear infections are one of the most common childhood illnesses, most often occurring in children up to age 6. Without treatment, the condition can persist into adulthood. Some children may be too young to communicate these symptoms, so parents can usually tell if their child is pulling at their ear, they are having difficulty hearing, or experiencing balance problems and dizziness. Research has shown that antibiotics are not effective in treating ear infections in the long term. This is where chiropractic comes in, getting to the root of the problem. Chiropractic adjustments are known to boost the immune system and promote overall wellness, but on top of that, proper alignment of the spine allows the muscles around the infected ears to relax. The Eustachian Tube is responsible for draining fluid from the ear. The nerves coming out of the upper cervical spine (the neck) influence the muscles surrounding the Eustachian Tube, and if any of the upper cervical bones are out of place, the muscles become tight and put pressure on that tube. This pressure makes it difficult for fluid to drain from the tube, which may cause an infection. Upper cervical adjustments are key in preventing the pressure buildup and subsequent ear infections, plus releases any pressure to relieve infections that may already be present. No child is too young or too small to be adjusted by a chiropractor. Chiropractic is a safe and healthy approach for all ages, from newborns to children and adolescents, all the way through adulthood. 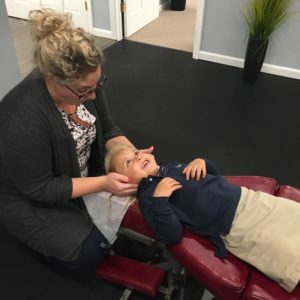 Chiropractors alter their force depending on the age and size of their patient, and the chiropractic team at MPR is gentle enough to ensure your child has a comfortable and calm experience. If you would like to make an appointment for your child to get adjusted at Monmouth Pain & Rehabilitation, to relieve or prevent ear infections, to help with another condition, or just to promote improved health and a strong immune system, please call 732-345-1377. So you’ve decided that now is the time to become healthier and physically fit. It’s a big decision, and it’s important to know your options in accomplishing your mission. One way is to bicycle. The positive effects of cycling are well established with studies that go back decades, and the benefits go beyond just “staying in shape”. According to Reuters Health in the journal Circulation, Anders Grontved, a researcher at the University of Southern Denmark in Odense studied the effects of bicycling for 45,000 Danish adults over 20 years. The study concluded that “biking either for recreation or as a way to commute is also great for heart health”. Grontved discovered that bike riders had 11-18 % fewer heart attacks than those who did not ride a bike. Biking as little as an hour a week provided some protection against coronary artery disease. Cyclists who ride for an hour a day have an 18% lower risk of all-cause mortality than non-cyclists. 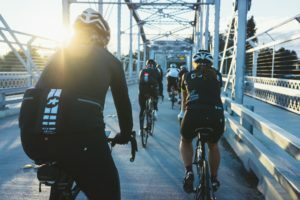 For those who ride an hour and a half or more, the benefit increases to 28%, according to a 2000 study in the Journal of the American Medical Association. Luckily, the results suggest it’s never too late to start. Riding your bike is a great way to get in shape and stay in shape. The benefits of physical fitness go beyond looking better and improving your fitness abilities. Another study published in the Journal of the American Medical Association recently looked at nearly 14,000 men and concluded that those with a higher fitness level as they approached middle age were at a lower risk for lung and colorectal cancer. According to cyclingweekly.com, bike riding can help with insomnia. Researchers at the University of Georgia studied men and women ages 20 to 85 over a period of 35 years, and found that a drop in fitness of 2% for men and 4% for women resulted in sleep problems. Dr. Rodney Dishman explained, “The steepest decline in cardiorespiratory fitness happens between ages 40 and 60. This is also when problems of sleep duration and quality are elevated.” Scientists suggested that the link between fitness and sleep could be due to exercise causing a reduction in anxiety, and thus improving the ability to sleep. Exercise also protects against weight gain, which is another cause of sleep dysfunction. Furthermore, a study from Stanford University concluded that participants who normally had trouble sleeping could fall asleep in half their normal time after bicycling 20 to 30 minutes each day. According to virsilas.com, researchers from the University of Illinois found that “a ﬁve percent improvement in cardio-respiratory ﬁtness from cycling led to an improvement of up to 15 percent in mental tests.” Bicycling can help the brain create new cells in the hippocampus, which is responsible for memory. “[Cycling] boosts blood ﬂow and oxygen to the brain, which ﬁres and regenerates receptors, explaining how exercise helps ward off Alzheimer’s,” says the study’s author, Professor Arthur Kramer. If you’ve had some type of injury or pain and are unsure of your ability to bike, the physical therapy team at Monmouth Pain & Rehabilitation can help you discover exercises that suit you and your body. Call 732-345-1377 for more information. It’s no secret that being active in sports may eventually correlate to an inevitable injury. Common treatments for injuries include taking anti-inflammatory medication, regular icing, as well as wound compression. Although these modalities are proven to help, it seems that we may be causing more harm when we look to medicate repeatedly. While medications can relieve pain and suffering, if used long term, they can also cause destructive side effects. The problem with these drugs are that they can affect the entire body, not just the part that hurts. Overuse of anti-inflammatories can be damaging to the gastrointestinal tract, which includes the esophagus, stomach and small intestine. Other risks may include, but are not limited to heart attack and/or stroke. Before feeling defeated and throwing in the towel, there are other treatment modalities available that are both safe and effective that may be able to help. Acupuncture is a form of alternative medicine that works with the body’s own energy. The common understanding of acupuncture is based on the concept of energy flow. Energy, more commonly referred to as “qi,” travels throughout the body in certain pathways. When there is a blockage of qi, this will usually result in an expression of pain. Small, sterile needles are inserted into specific areas of the body to stimulate the movement of energy and circulation, which promotes the body’s self-healing ability. These access energy pathways and can help “unblock” the energy. They also increase circulation to the area, facilitating in the aid of healing the area more quickly. Acupuncture continues to gain additional support as evidence of the benefits consistently increases. Sports medicine is embracing acupuncture, as athletes are benefiting from treatments tremendously. Acupuncture can address both acute and chronic injuries. Elbow, knee and back pain are frequent injuries experienced by athletes, as well as muscle strains, sprains and tendonitis. Ailments like arthritis and inflammation may also benefit with the incorporation of acupuncture into the treatment. While acupuncture has created a name for itself in the treatment and management of pain, it has numerous other positive effects on the body. 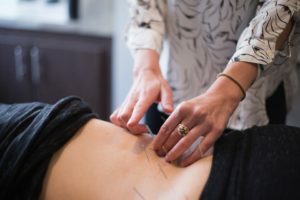 Incorporating acupuncture into the treatment protocol can decrease inflammation, restore function of the affected area, and reduce the recovery time of injuries by almost half. Acupuncture points will vary based on which body part is being treated, but there are a few points that can help with general pain and strengthen the energy of the body. A very effective protocol called Four Gates includes the points Liver 3 (LV3) and Large Intestine 4 (LI4), which is effective in moving the Qi and blood in the body, thus clearing stagnation and alleviating pain. LI4 is a very common point used for many conditions. It is located in the middle of the second metacarpal bone on the radial side. It is beneficial for any condition related to the face and head, including sinus pressure, headaches, jaw pain, toothaches and allergies. It can also be used to treat Wind-Heat conditions like the flu. LI4 can help strengthen the immune system and decrease duration of colds. Finally, LI4 is known as the “pain point” in the body. It is great in clearing inflammation anywhere in the body. 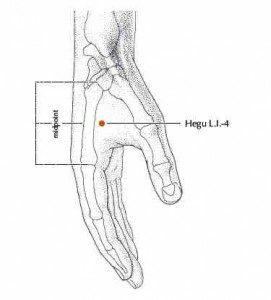 LV3 is another commonly used point that is great for creating movement throughout the body. 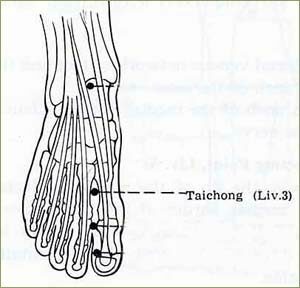 It is located on the dorsum of the foot in a depression distal to the junctions of the 1st and 2nd metatarsal bones. It can be used for any liver energy disharmony, including menstrual disorders, headaches, and detoxification. It is also useful in calming the nervous system, which can help treat insomnia, stress and anxiety. Acupuncture is a safe and effective treatment, with little to no side effects. It is commonly known for being used in pain management, but has the capacity to treat a multitude of symptoms. Aches and pains, headaches, infertility, anxiety, gastrointestinal and respiratory issues are just some of the frequently treated indications. Next time you find yourself reaching for an Advil or over the counter medicine, consider an alternative treatment first. You may find yourself pleasantly surprised and feeling better. To make an appointment with one of the licensed acupuncturists at Monmouth Pain & Rehabilitation, call 732-345-1377 or fill out the form on the right side of this page. Whether you have injured yourself through sports or other hobbies, or have some sort of chronic pain, you could find healing for your whole body. Monmouth County acupuncture is just within reach in Shrewsbury, Wall Township, and coming soon to Lacey for Ocean County residents seeking acupuncture!